I’m sure that all sorts of different attractions would love to have their names show up automatically! I would think that Niagara Falls is considered a waterfall. A drive-through festival of holiday light display was to be switched on, followed by a fireworks show, the evening of Wednesday, Nov. 23 in Hyde Park. There were more than 20 displays available Wednesday, but Peter P. Robinson, head of A Hand Up Inc., said the number will soon increase to about 35. Last night the family went for a brief drive along the Niagara Parkway to check out the Ontario Power Generation Winter Festival of Lights. It is the first time I’ve seen all of the lights at night. They look excellent. There are a lot more than there used to be. I mentioned this to someone and wondered what this had to do with Christmas. 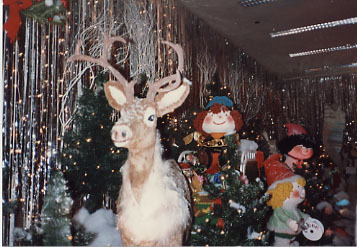 The person said that the Disney displays didn’t really have anything to do with Christmas either. Very true. Dufferin Islands has some new displays. I made a simple animated gif of one display that shows a bird taking off/flying. Along the hill/escarpment by the Skylon Tower, some lights have been put out that flash intermittently, so it looks like the hill is twinkling. You’re going to hear a lot of Niagara Falls composer Nathan Chamberland at the upcoming Winter Festival of Lights. Over and over again. 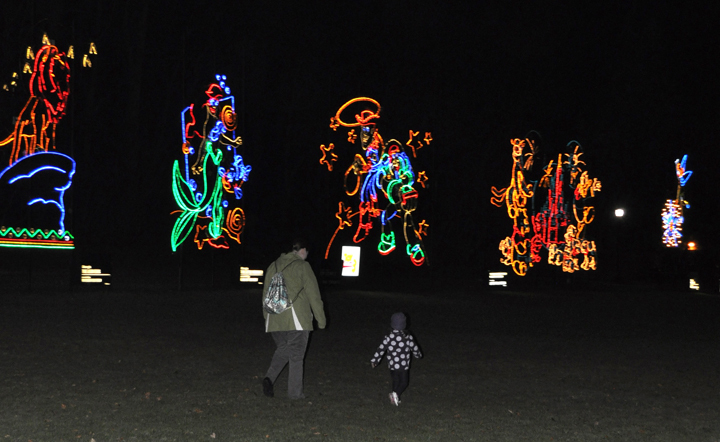 An eight and a half minute score Chamberland wrote will be matched with the light displays at Dufferin Islands, giving the park a musical component to go with several new attractions. Chamberland, a veteran musician who ran the Niagara Music Awards for two years, says his name was brought up to Festival organizers who were looking for a local artist to create the score. Needless to say, we have seen many changes over the years. We saw the Disney displays arrive, grow, then go. The kids my parents brought to Niagara every year have grown and gone on to marry. There is now a third generation discovering the festival of Lights in the form of my niece and nephew who are even younger than we were when we started this Thanksgiving tradition. There were Disney displays and that little village in front of Queen Victoria Place Gift Shop. That year that was a Carousel there too. She saw the animals and animated displays at Dufferin island that we always enjoyed. Noah’s ark was always a favorite. The dinosaurs didn’t make sense outside of the fact that they appeared around the time Jurassic Park was out. But I guess they have an appeal for little boys. Speaking of “appeal”, let’s talk about the new displays at Dufferin (pictures below). While I appreciate the beauty, concept and engineering of the new displays – my niece started talking about “the banana”. I didn’t get it at first, but then I realized that the abstract centerpiece did, indeed, look like a banana being peeled. Being a graphic designer and having worked in Marketing departments for 20 years, I could both appreciate what was being done here…and question what was being done here. I’ll expound on that in a later post, but for now, I’ll wrap things up by saying I had a wonderful time with my family during this trip. As always, Niagara kicked off our Christmas season with style, and it wouldn’t be Christmas without it. 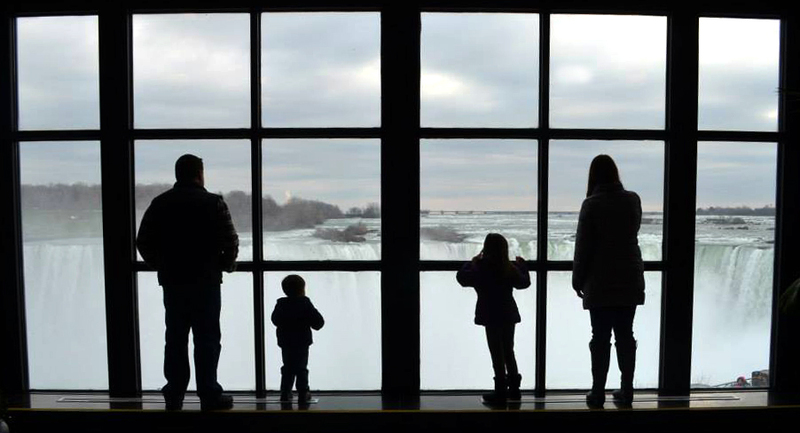 So long until next time, Niagara….. While the mighty mouse may be gone, the Ontario Power Generation Winter Festival of Lights has added turtle power to its upcoming season. The festival parted ways with Disney in 2013 after more than 20 years of partnering with them for light displays and various attractions including having Mickey and Minnie Mouse participate in the opening ceremonies. This season, organizers have partnered with Paramount Canada for a new display featuring the Teenage Mutant Ninja Turtles. The illuminated renditions of Leonardo, Michelangelo, Donatello and Raphael will be set up at the top of Clifton Hill. There will also be a special screening of the latest Teenage Mutant Ninja Turtles movie at the Ripley’s Moving Theatre on Dec. 16, the day the summer movie will hit store shelves on Blu-Ray and DVD. “We are always seeking new and creative ways to expand the festival and this partnership brings a new element to the attraction,” said Brian Crow, co-chairman of the festival. The festival’s 32nd season runs from Nov. 15 to Jan. 12.